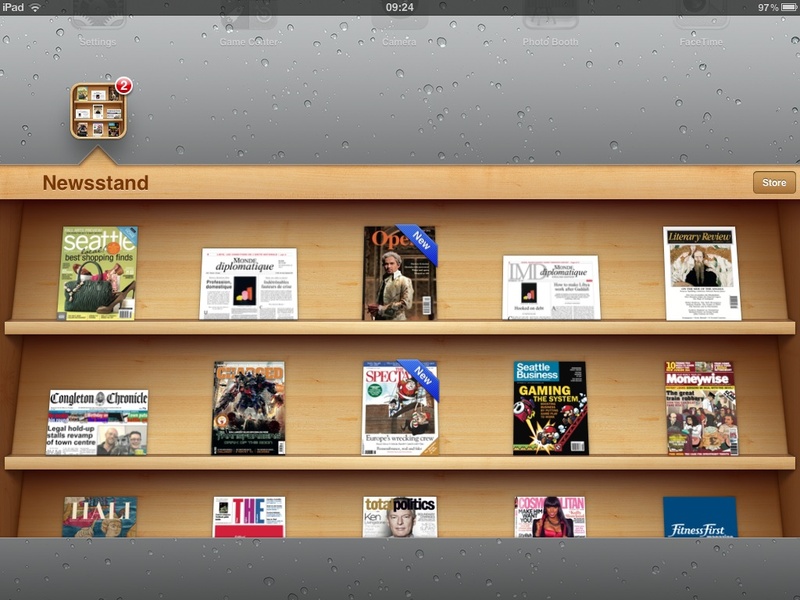 Apple’s Newsstand was introduced with iOS5 and it is defined as ‘a custom newsstand for all your subscriptions’. It puts all your periodical subscriptions in one place, a Newsstand, a folder, that ‘lets you access your favorite publications quickly and easily‘. At this stage it has three particular advantages for the user: first, it does the sorting for you and puts your subscriptions in the one folder, collecting them together on the iPhone/iPad (many of us are lazy about arranging apps); second, apps which are handled through this route will update automatically in the background when a new issue appears — a big plus since many magazine apps are very slow to upload; third the front covers of the current issues are shown on the shelves of your newsstand, a fact which makes these apps rather more interesting and appealing than most app cover artwork. This is an especially strong point for magazines, many of which have outstanding cover designs. This is a classic instance of Apple’s ‘skeuomorphism’. Skeuomorphism, originally a term from archaeology, is type of ornamentation where the design or look of the object helps the user to understand the function of the device or tool. Greeks made bronze jugs and vases that looked as though they had been made from coiled pottery, with curious twists and patterns, because these derivative ornaments helped the user to know which bit to grasp as the handle and how to direct the spout. iOS5 and its apps are riddled with skeuomorphism — some of which goes over the top. Much of it incredibly helpful: paperclips that indicate an attachment, soft calculators that work like calculators, brushes that brush, cameras that have buttons and dials etc. The fact that the newsstand is a pine shelving system is helpful skeuomorphism because we know how to arrange items on a shelf, we know how to ‘read’ a shelf, we understand that the objects on the shelf will remain ‘there’ on both phone and pad and we know that can pick up one, or several of these objects and dive into them. All of this maps the functionality of shelved stuff straight into our collection of subscriptions. All is well and good. The problem lies elsewhere. The metaphor of the ‘personal shelf’ works well enough for an individuals collection of 6 or 60 periodical subscriptions. But it provides no help at all when we come to the other angle on Apple’s new newsstand. The newsstand is not just a way of organizing an individuals collection of subscription, it is a new classification within the app store for periodicals which are consistent with the distribution and access rules that pertain to the individual-facing, personal newsstand within an iOS device. ‘Newsstand’ is a new and rather unusual category within the iTunes store itself, and only the apps which would work on the ‘pine-shelf’ personal newwstand appear there. A lot of newspapers and many magazines have not appeared in newsstand yet, perhaps because the developers have not yet got round to it, but others are not there because they never will be. Apps like Flipboard or Zite which aggregate magazine content will not be going into the newsstand, nor will news apps that are based on real-time newsfeeds (there is still a seperate ‘news’ category for apps which are not in Newsstand). The ‘newsstand’ within iTunes is not a section for all newsy apps, it is a category for periodical subscriptions which meet some very specific criteria. All existing print periodicals could be transferred to it provided that the publishers develop an app which matches these criteria, so it will soon be an enormous emporium of periodicals. In fact what iTunes now needs is some sort of virtual kiosk, which would allow the prospective purchaser to float past and search thousands and tens of thousands of prospective periodical titles that might be purchased. For this task the pine-shelved personal newsstand is no good at all. We need a very different metaphor for the mega-kiosk that Apple’s iTunes magazine store is rapidly becoming. I suspect that Apple will soon be wishing that they had chosen a more flexible, and a more scaleable skeuomorphism for their magazine collection that the individual selects for herself. A carousel or a cascade of front covers that could be more easily translated or analogised to the requirements of the global kiosk. Google a month ago put up an example of the kind of carousel interface that might work well for a global range of magazine titles. Final thought: I have never liked the pine bookcase metaphor at all. I would never put my printed magazines on such a shelving system — its too reminiscent of a dentist’s waiting room. If Apple decides that it was the wrong skeuomorph, perhaps they should smash up the pine bookshelves and turn them into kindling?